We have recently shown that curcumin (a diferuloylmethane) inhibits growth and induces apoptosis, and also demonstrated that TRAIL induces apoptosis by binding to specific cell surface death receptors in prostate cancer cells. The objectives of this paper were to investigate the molecular mechanisms by which curcumin enhanced the apoptosis-inducing potential of TRAIL in prostate cancer cells. Curcumin enhanced the apoptosis-inducing potential of TRAIL in androgen-unresponsive PC-3 cells and sensitized androgen-responsive TRAIL-resistant LNCaP cells. Curcumin inhibited the expressions of Bcl-2, Bcl-XL, survivin and XIAP, and induced the expressions Bax, Bak, PUMA, Bim, and Noxa and death receptors (TRAIL-R1/DR4 and TRAIL-R2/DR5) in both cell lines. Overexpression of dominant negative FADD inhibited the interactive effects of curcumin and TRAIL on apoptosis. Treatment of these cells with curcumin resulted in activation of caspase-3, and caspase-9, and drop in mitochondrial membrane potential, and these events were further enhanced when combined with TRAIL. 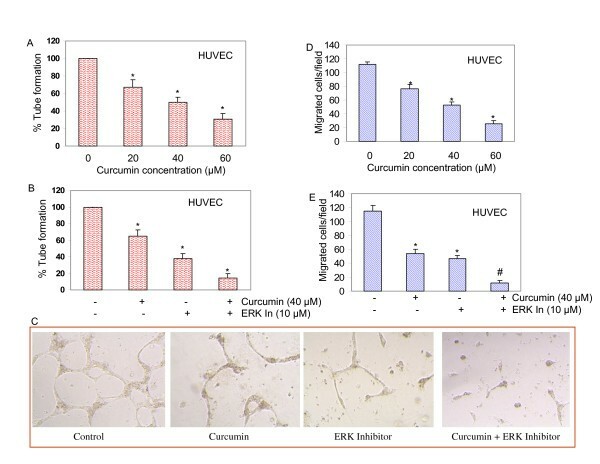 Curcumin inhibited capillary tube formation and migration of HUVEC cells and these effects were further enhanced in the presence of MEK1/2 inhibitor PD98059. The ability of curcumin to inhibit capillary tube formation and cell migration, and enhance the therapeutic potential of TRAIL suggests that curcumin alone or in combination with TRAIL can be used for prostate cancer prevention and/or therapy. Epidemiological data support the concept that naturally occurring compounds in the human diet are safe, non-toxic, and have long lasting beneficial effects on human health. Curcumin [1,7-bis(4-hydroxy-3-methoxyphenyl)-1,6-hepatadiene-3,5-dione; diferulolylmethane], a major constituent of the yellow spice turmeric derived from the rhizomes of Curcuma spp., is one such compound . It has been used in Asian food for centuries . Curcumin has been reported to have several pharmacological effects including anti-tumor, anti-inflammatory and anti-oxidant properties [3–7]. Recent studies have also suggested that it can inhibit tumor metastasis, invasion and angiogenesis [7–11]. We have recently shown that curcumin induces apoptosis in prostate cancer cells by inhibiting Akt activity upstream of mitochondria, and Bax and Bak genes completely inhibit curcumin-induced apoptosis [12, 13]. Furthermore, curcumin inhibits NFκB activity in cancer cells [8, 14] and sensitizes cancer cells to chemotherapy and radiotherapy [15–21]. Binding of TRAIL to its receptors TRAIL-R1/DR4 and TRAIL-R2/DR5, both of which contain a cytoplasmic region of 80 amino acids designated as the "death domain", activated the extrinsic apoptosis pathway. Death receptors DR4 and DR5 can recruit the initiator caspases, caspase-8 and caspase-10, by a homotypic interaction between the death effector domains of the adapter molecule Fas-associated death domain (FADD) protein and the prodomain of the initiator caspase, thereby forming the death-inducing signaling complex (DISC). The formation of active DISC is essential for TRAIL to transmit apoptotic signals. We and others have shown that tumor-selective targeting molecules such as tumor necrosis factor (TNF)-related apoptosis-inducing ligand (TRAIL) induces apoptosis in prostate cancer cells, both in vitro and in vivo [22–25]. Data on experimental animals and primates led us to believe that TRAIL has great promise as a selective anticancer agent [22, 23, 26]. We have recently demonstrated that TRAIL induces apoptosis in several prostate cancer cells lines, but it was ineffective in inducing apoptosis in LNCaP cells [22, 23, 27]. Chemopreventive agent curcumin has been shown to sensitize TRAIL-resistant prostate cancer cells in vitro [28–30]. However, the molecular mechanisms by which curcumin sensitizes prostate cancer cells to TRAIL treatment are not well understood. Angiogenesis, the formation of new blood vessels from preexisting capillaries, is essential for tumor progression and metastasis, and consists of a multistep process involving an array of molecular signals [31, 32]. During tumor neovascularization, multiple processes (including the stimulation of endothelial cell proliferation, migration and assembly; the recruitment of perivascular cells; and extracellular matrix modeling) are involved. Ras-Raf-MEK-ERK signal transduction pathway has been shown to play an active role in angiogenesis. It is not clear whether ERK plays an active role in antiangiogenic effects of curcumin. In order to examine the involvement of death receptor pathway on interactive effects of curcumin plus TRAIL, we used dominant negative FADD (DN-FADD). We have previously shown that DN-FADD blocked the interactions of TRAIL with histone deacetylase inhibitors, resveratrol, ionizing radiation or anticancer drugs [23, 33, 34]. 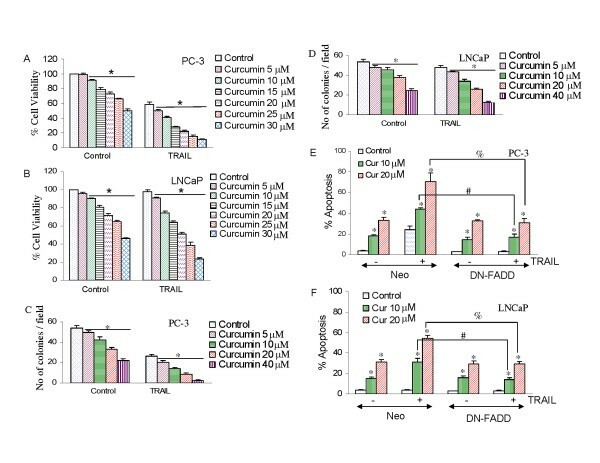 As before, curcumin induced apoptosis in both PC-3/neo and LNCaP/neo cells (Fig. 1E and 1F). Curcumin enhanced the apoptosis-inducing potential of TRAIL in PC-3/neo cells, and sensitized TRAIL-resistant LNCaP/neo cells to undergo apoptosis. Transfection of DN-FADD had no effect on curcumin-induced apoptosis in both PC-3 and LNCaP cells, whereas it inhibited TRAIL-induced apoptosis in PC-3 cells. The ability of curcumin to enhance TRAIL-induced apoptosis in PC-3 cells, and its sensitization of TRAIL-resistant LNCaP cells was blocked by DN-FADD. These data suggest that death receptor pathway is involved in transducing effects of curcumin and TRAIL. Activation of death receptors (TRAIL-R1/DR4 and TRAIL-R2/DR5) by TRAIL transmits caspase-dependent apoptosis signal . We have recently shown that chemotherapeutic drugs, histone deacetylase inhibitors and γ-irradiation upregulate death receptors DR4 and/or DR5, and thus enhance the effectiveness of TRAIL [22, 23, 33, 34, 36, 37]. Since curcumin enhances the apoptosis-inducing potential of TRAIL, we measured the expression of cell surface death receptors by flowcytometry (Fig. 2 and 3). Curcumin had no significant effect on the expression of DcR1 and DcR2 in PC-3 (Fig. 2) and LNCaP (Fig. 3) cells. 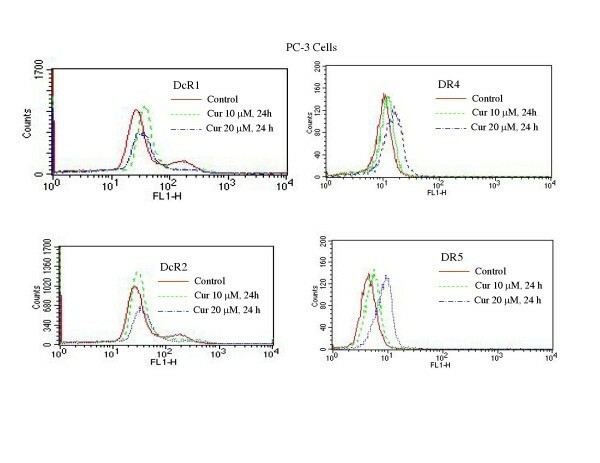 By comparison, treatment of these cells with curcumin resulted in an increased expression of DR4 and DR5 in both cell lines. These data suggest that upregulation of death receptor DR4 and DR5 by curcumin may enhance the apoptosis-inducing potential of TRAIL in PC-3 and LNCaP cells. Bcl-2 family members regulate apoptosis induced by stress stimuli primarily at the level of mitochondria [34, 38, 39]. We, therefore, examined the effects of curcumin on the expression of Bcl-2 family members. 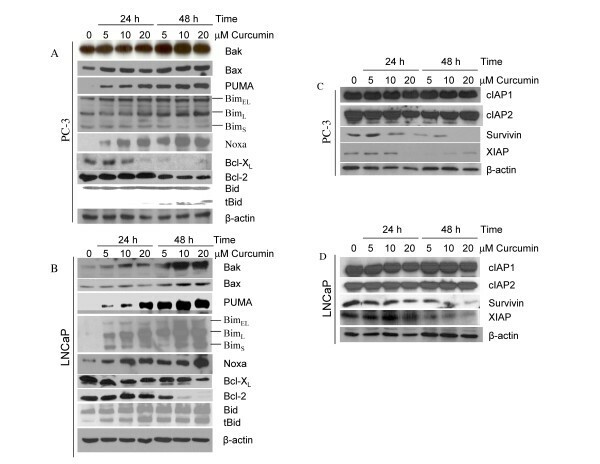 The Western blot analysis showed that curcumin induced expression of pro-apoptotic proteins Bak, Bax, PUMA, Bim and Noxa, and inhibited expression of anti-apoptotic protein Bcl-XL and Bcl-2 in PC-3 cells (Fig. 4A). It is important to note that the expression of BimL isoform was significantly higher with all the doses of curcumin treatment at 48 h compared to control. The cleavage of Bcl-2 family member Bid to tBid (truncated Bid) is essential for linking death receptor pathway to mitochondrial pathway. We therefore measured whether curcumin treatment causes cleavage of Bid. Treatment of PC-3 cells with curcumin resulted in cleavage of Bid to tBid. Similarly, curcumin induced expression of Bak, Bax, PUMA, Bim and Noxa, and inhibited expression of Bcl-XL and Bcl-2 in LNCaP cells (Fig. 4B). Furthermore, Bid was cleaved by curcumin in LNCaP cells. These data suggest that Bcl-2 family members may regulate sensitivity of prostate cancer cells to curcumin and/or TRAIL. We have shown that activation of death receptor pathway by TRAIL plays a major role in apoptosis [25, 35]. The upregulation of death receptors by chemotherapeutic drugs, irradiation and chemopreventive agents have been shown to sensitize cancer cells to TRAIL treatment [23–25, 33, 34, 36, 37]. 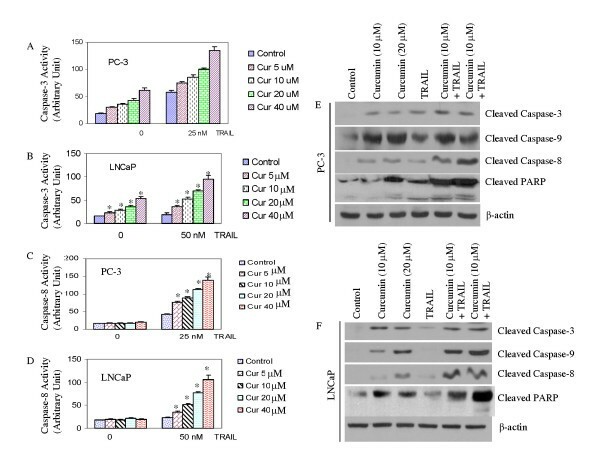 In the present study, we have demonstrated that curcumin enhances the therapeutic potential of TRAIL in PC-3 cells and sensitizes TRAIL-resistant LNCaP cells by upregulating DR4 and DR5, and regulating Bcl-2 family members and IAPs. Furthermore, curcumin potentiates the apoptotic effects of chemotherapeutic agents and cytokines through down-regulation of NFκB and NFκB-regulated gene products in bladder cancer , prostate cancer , and ovarian caner . TNF-induced NFκB-regulated gene products involved in cellular proliferation (cyclooxygenase-2, cyclin D1, and c-myc), antiapoptosis [inhibitor of apoptosis protein (IAP)1, IAP2, X-chromosome-linked IAP (XIAP), Bcl-2, Bcl-XL, Bfl-1/A1, TNF receptor-associated factor 1, and cellular Fas-associated death domain protein-like interleukin-1beta-converting enzyme inhibitory protein-like inhibitory protein], and metastasis (vascular endothelial growth factor, matrix metalloproteinase-9, and intercellular adhesion molecule-1) were also down-regulated by curcumin . These findings suggest that curcumin, in addition to activating cell-intrinsic pathway, can regulate cell-extrinsic (death receptor) pathway of apoptosis and may circumvent chemoresistance to conventional chemotherapeutic agents or TRAIL. 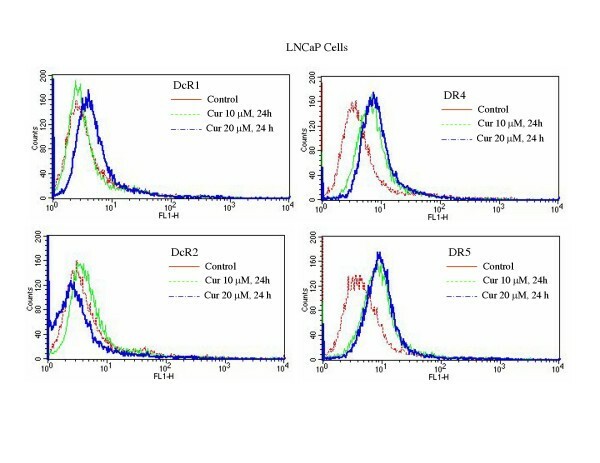 We have also demonstrated that another chemopreventive agent resveratrol enhanced the apoptosis-inducing potential of TRAIL in PC-3 cells  and sensitized TRAIL-resistant LNCaP cells  by engaging both cell-intrinsic and cell-extrinsic pathways of apoptosis. The serine/threonine kinase Akt/PKB has been considered an attractive target for cancer therapy and prevention . Akt kinase plays critical roles in mammalian cell survival and is constitutively active in various cancers [12, 46–48]. We have recently shown that curcumin upregulates the expression, phosphorylation (at serine 15) and acetylation of p53 . Treatment of LNCaP cells with curcumin results in translocation of Bax and p53 to mitochondria, production of reactive oxygen species, drop in mitochondrial membrane potential, release of mitochondrial proteins (cytochrome c, Smac/DIABLO and Omi/HtrA2), activation of caspase-3 and induction of apoptosis . Furthermore, curcumin inhibits expression of phosphatidylinositol-3 kinase (PI3K), and phosphorylation of Ser 473 Akt. Downregulation of Akt by inhibitors of PI3K (Wortmannin and LY294002) and Akt, or by dominant negative Akt increases curcumin-induced apoptosis, whereas transfection of constitutively active Akt attenuates this effect. Similarly, wild type phosphatase and tensin homolog deleted from chromosome 10 (PTEN) enhances curcumin-induced apoptosis. 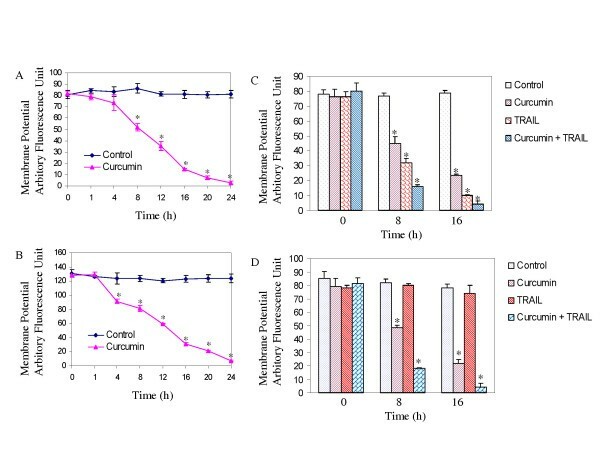 Furthermore, overexpression of constitutively active Akt inhibits curcumin-induced p53 translocation to mitochondria, and Smac release to cytoplasm, whereas inhibition of Akt by dominant negative Akt enhances curcumin-induced p53 translocation to mitochondria and Smac release . These studies establish a role for Akt in modulating the direct action of p53 on the caspase-dependent mitochondrial death pathway and suggest that these important biological molecules interact at the level of the mitochondria to influence curcumin sensitivity. We have also demonstrated that curcumin causes acetylation of histone H3 and H4 in prostate cancer cells , suggesting histone modification may regulate gene transcription related to cell growth, differentiation and apoptosis. Activation of the Raf-MEK-ERK signal transduction pathway in endothelial cells is required for angiogenesis . Activating mutations in RAS and RAF result in inappropriate activation of downstream kinases, mitogen-activated protein kinase kinase (MEK) and extracellular signal-regulated kinase (ERK), and deregulated mitogenic and cell survival signaling . The frequent derangement of these molecules in human cancers provides the rationale for their inhibition by pharmacological approaches. Our studies demonstrate that curcumin can inhibit capillary tube formation and endothelial cell migration, and these effects can be enhanced by MEK inhibitor. Curcumin has been shown to inhibit the expression genes involved in angiogenesis and metastasis (VEGF, ICAM-1, CD31, MMP-9) [7, 9, 10, 15]. Thus, curcumin can inhibit tumor growth by inhibiting angiogenesis. Curcumin has been shown to inhibit neoplastic initiation, promotion, and progression in several cancers. Curcumin inhibits tumor formation induced by ben(a)pyrene(BP), and 7,12-dimethylbenz(a)antracen (DMBA) in mouse model of gastric and skin tumors, respectively [51–53]. Furthermore, the administration of 4% curcumin in the diet of azoxymethane-treated mice reduced the number of colon tumors by 66% . The clinical significance of curcumin in vivo is not yet clear. Data regarding the pharmacokinetics of curcumin suggest that there is a poor bioavailability in humans due to its rapid metabolism in the liver and intestinal wall, when taken orally [5, 55–57]. Piperine has been shown to increase the bioavailability of curcumin by 2000% . Curcumin significantly inhibited the cellular production of proinflammatory mediators such as TNFα and nitric oxide, and significantly inhibited the release of MCP-1 from adipocytes . Curcumin can suppress obesity-induced inflammatory responses by suppressing adipose tissue macrophage accumulation or activation and inhibiting MCP-1 release from adipocytes, and thus it may have a potential to improve chronic inflammatory conditions in obesity. Curcumin is currently in clinical trials for the treatment of various cancers  and for Alzheimer's disease. Mitochondrial energization was determined by retention of JC-1 dye (Molecular Probes Inc., Eugene) as we described earlier [22, 63]. Briefly, drug treated cells (5 × 105) were loaded with JC-1 dye (1 μg/ml) during the last 30 min of incubation at 37°C in a 5% CO2 incubator. Cells were washed in PBS twice. Fluorescence was monitored in a fluorometer using 570-nm excitation/595-nm emission for the J-aggregate of JC1 . ΔΨm was calculated as a ratio of the fluorescence of J-aggregate (aqueous phase) and monomer (membrane-bound) forms of JC1.